A folk dancer since childhood, Roo has been observing, learning, and studying Scandinavian dance ever since she watched a couple dance the Hambo while at college. ​Today she is recognized as one of our nation's foremost proponents of Scandinavian dance. ​Read more below. Roo Lester teaches many different kinds of Scandinavian dance, but has focused especially on what she calls the turning dances of Norway and Sweden. Whenever possible she teaches with her husband, Larry Harding. Roo has traveled extensively in Scandinavia since 1983, studying dance and testing her skills as a participant in numerous courses and competitions. She served as the American coordinator for several dance and music camps in Scandinavia. Roo's work has included teaching folk dance in the public schools, choreographing and dancing in performing groups, and directing folk dance camps. She also has written and published a number of lengthy descriptions of Norwegian dances including Telespringar, Hallingspringar, and Valdresspringar; a guide to Scandinavian dance basics; and several other articles. As dance instructors, Roo and Larry’s hallmarks include clear, positive teaching that incorporates background information, styling, and technique, and their enthusiasm for sharing their love of Scandinavian dance with everyone is evident. 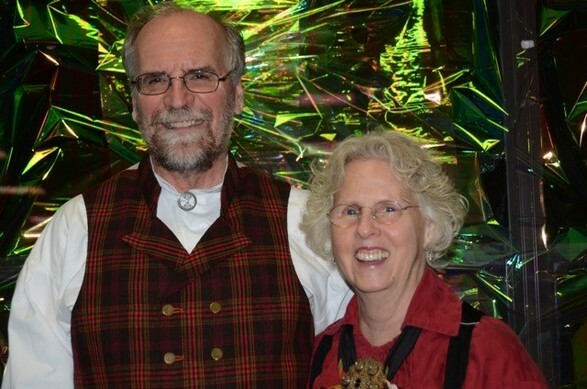 The couple's talent for presenting the basic concepts of Scandinavian dance in a fun and lighthearted manner has earned them praise and appreciation from campers from Mainewoods and Stockton to Pinewoods and numerous other folk dance destinations. Some additional educational materials sent to us post-camp by Roo. Description: "Pols dance from Finnskogen in great reconstructed folk clothing. Bjørn Sverre Hol Haugen and Veslernøy Nordset won the senior regular fiddle in 2009. The tune is a pols after Marinus Amudsen from Sørskogbygde." Description: "Regular fiddle at the national competition 2015/Hilme 2015. Bjørn Sverre Hol Haugen and Veslernøy Nordset [dancers]—Pols dance from Finnskogen. Fiddler: Ole Nilssen." Description: "From the national competition in Fagernes on 24 July 2015. Pols dance from Finnskogen by Anbjørg Myhra Bergwitz & Audun Gruner-Hegge."